"It is if you first become a part of nature. You suppress your presence as a human being, stay very still, and convince yourself that you are a tree or grass or a flower. It takes time, but once the butterfly lets its guard down, you can become friends quite naturally." Happy New Year! What a glorious way to start a year: a new garden with new plants! The first batch of seeds I started back in November are for the most part doing well. They have been potted up from their little one inch cells into larger celled containers. The next batch of seed sprouting will commence the first half of January, 2014. 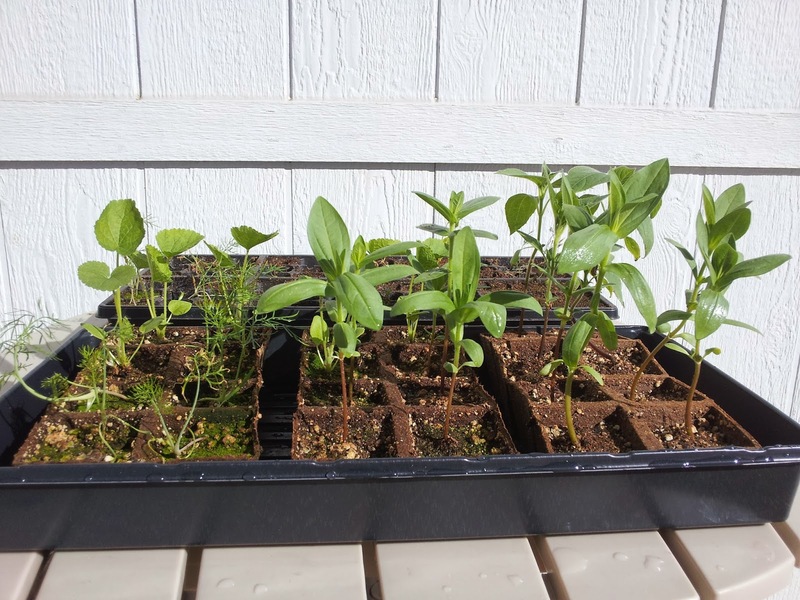 By mid February I should have a goodly amount of plants to play with, utilizing the initial seed started plants, plus the ones I've been buying online and at local nurseries. The January starts (to be planted shortly) will be ready for containers by mid March. I was a bit overenthusiastic and jumped the gun on starting the first batch too early. Or maybe not. It has been a lingering, higher than normal warm late fall and early winter so far. The little plants have been growing like crazy! I've relocated them outside to take advantage of the warmth and light. 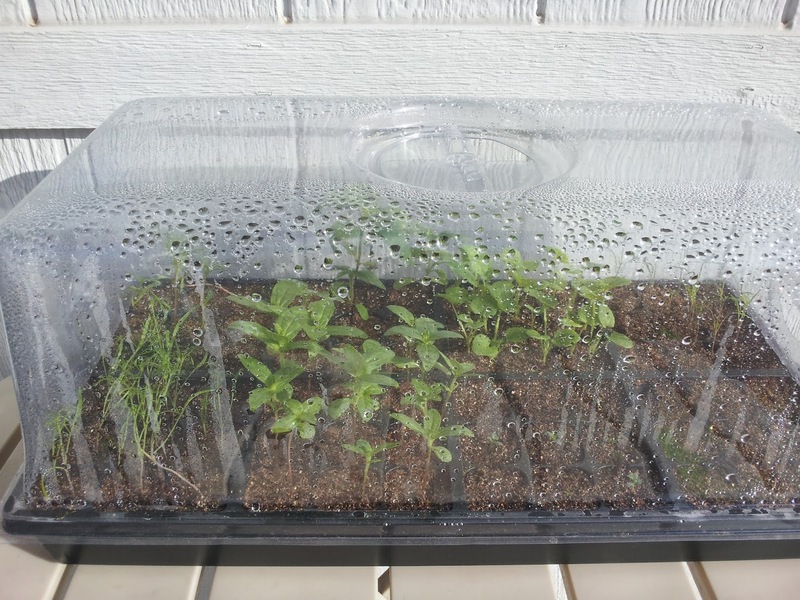 They are almost to the point where they'll outgrow the 2-1/4 inch peat pots I transplanted them into and the special clear plastic high domes I bought for them. If the outside temps were "normal", I doubt they'd be so large by now. We've only experienced two days of frost so far this season; winter hasn't really arrived yet and I have these tender seedlings with little room inside the house to stash them in during frost warnings. Where I live, it would behoove me to start plants no earlier than the beginning of January. Initially start them in larger cells. The tiny cell tray inserts that came with the seed starting trays I purchased make it hard to eject the seedlings for potting up. Quite a few plants were lost to broken up roots while trying to wrangle them out of the flimsy plastic cells. It's better to start off with the 2-1/4 inch peat pots I used for potting up. 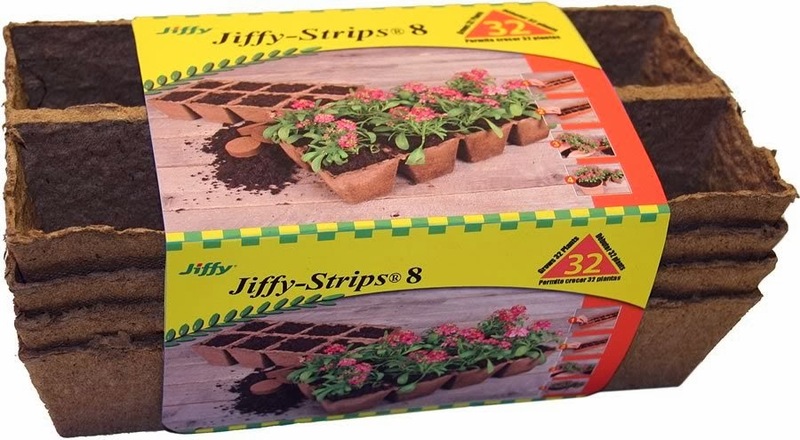 Don't use the Jiffy Pot seed starter soil. I liked it at first, as it holds moisture well, but as the seeds germinate and grow, it holds water too well, creating lots of algae growth on the soil's surface and increases the likelihood of pathogens. I'll be looking into some of the other available brands besides Jiffy's and Miracle-Gro, of which I've read poor online reviews. Made out of compressed peat, one can plant these cell and all directly in soil without damaging or disrupting delicate root balls. They disintegrate, allowing the roots to venture out. 32, 2-1/4 inch peat cells to a tray. In the meantime as I'm watching my little guys grow, I've been scouring the Lowe's, Home Depots, and various local nurseries in the San Marcos/Escondido area for more containers. So far I've come up with three new pots at substantial savings! YAY!